I came to this website to inform you about a massive unrecognized resource of info on Flat Earth ! "And then a man stood up and ask him questions ... the man said: inform me of the size of the sun and the moon. Imam Ali (as) replied :" they [both] are 900 Farsakh long and 900 Farsakh wide (each Farsakh is 5.8 kilometers)"
-uses only two dimensions instead of three ! While I probably disagree with you about the science here, I want you to know that I have long prayed for peace and understanding between the United States and Iran. Today I will add one more prayer that you are met here with respect rather than the prejudice that often erupts from the west. That is the distance from Earth the sun and moon are in common flat earth models. Of course Shia Islam is only a minority and most Muslims follow the Sunni tradition. Al Islam.org, Question 37: Rotation of The Earth. Not being a Muslim, I would not be qualified to debate the issue in any way. You could make those same kind of arguments for the Qur'an supporting a flat earth. I've seen the carpet Earth as an example of a flat earth and now the cradle is compared to a globe. The 5000 km distance is the height above Earth. They are typically quoted as being around 50 km wide. For their apparent size of 0.5 degrees, having them 5200 km wide would require them to be roughly 600 000 km away. This means assuming it is above a point at 90 degrees south, then on the other side of the world (40 000 km away over the ground), the sun would appear at an angle of roughly 861 degrees. This makes it even harder for the sun to set. Of course,the Quranic FE model is one in which the sun sets below Earth, going into a mud-puddle. Nothing like the BS people are pedalling now. Close enough to the common figure. What I mean is that 5000 km is the height above Earth, not its width. Its width is claimed to be around 50 km if I recall correctly. He is saying the sun is 5000 km wide. I know, I was simply stating that the width proclaimed here is about the same as the altitude of the sun in common FE models. I don’t believe that it is necessary for ancient religious texts to be scientifically accurate in order for them to be sources of wisdom and inspiration. Islam is NOT garbage, and the ratio of Shi’a to Sunni is not evidence of anything. Just be respectful, or at least take your debate to the “bash religion” thread. If the OP can't understand that you only need one measurement to describe the size of a spherical object, then he's an idiot. Founder member of the League Of Scientific Gentlemen and Mademoiselles des Connaissances. I am pompous, self-righteous, thin skinned, and smug. Religions claiming Earth is flat is not evidence of Earth being flat. Instead it is evidence the religion is wrong. If you wish to use a religion to try and prove Earth is flat you would first need to prove the religion is true. Ancient religious texts are not science texts. Yes, they are a bunch of fairy tales. Not something to try and prove Earth is flat. I'm reposting this here since I didn't receive any answers there and I find this a relevant topic. 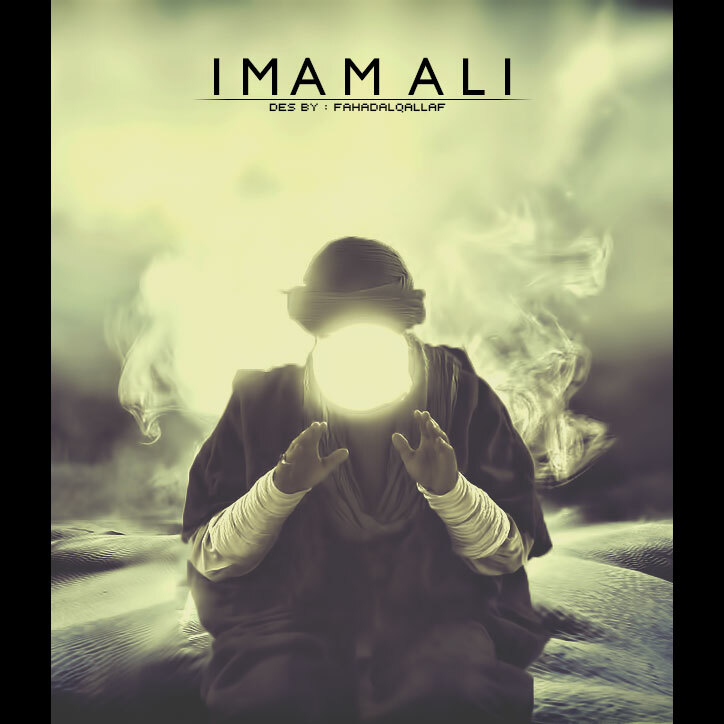 I was reading through Nahjul Balagha, https://www.al-islam.org/nahjul-balagha-part-1-sermons/sermon-1-praise-due-allah-whose-worth-cannot-be-described , a book about the sermons of Imam Ali, who was (according to Muslims), the first divinely appointed successor to the Muslim prophet Muhammad. In there, in the first sermon, he mentions some strange things about the creation of the universe, many of them allude to the flat earth theory. However, I'm not sure if i'm interpreting it correctly. Then Almighty created forth wind and made its movement sterile, perpetuated its position, intensified its motion and spread it far and wide. Then He ordered the wind to raise up deep waters and to intensify the waves of the oceans. So the wind churned it like the churning of curd and pushed it fiercely into the firmament throwing its front position on the rear and the stationary on the flowing till its level was raised and the surface was full of foam. Then Almighty raised the foam on to the open wind and vast firmament and made there-from the seven skies and made the lower one as a stationary surge and the upper one as protective ceiling and a high edifice without any pole to support it or nail to hold it together. Then He decorated them with stars and the light of meteors and hung in it the shining sun and effulgent moon under the revolving sky, moving ceiling and rotating firmament. He has arranged the depressions and elevations of the openings of the sky. He has joined the breadths of its breaches, and has joined them with one another. He has made easy the approach to its heights for those (angels) who come down with His commands and those (angels) who go up with the deeds of the creatures. He called it when it was yet (in the form of) vapour. At once the links of its joints joined up. Then Allah opened up its closed door and put the sentinels of meteors at its holes, and held them with His hands (i.e. power) from falling into the vastness of air. He commanded it to remain stationary in obedience to His commands. He made its sun the bright indication for its day, and moon the gloomy indication for its night. He then put them in motion in their orbits and ordained their (pace of) movement in the stages of their paths in order to distinguish with their help between night and day, and in order that the reckoning of years and calculations may be known by their fixed movements. Then He hung in its vastness its sky and put therein its decoration consisting of small bright pearls and lamp-like stars. He shot at the over-hearers arrows of bright meteors. He put them in motion on their appointed routine and made them into fixed stars, moving stars, descending stars, ascending stars, ominous stars and lucky stars. Do these narrations also point to the flat earth model? You did not get an answer because tfes isn't a real forum. It is shadow of this website, like an alt account. Their admins and moderators are nothing but a bunch of adolescents. These narrations point the flat earth; but as a hanef I have not to agree them. On the other hand, if we will discuss anything about islam so we have to referre the quran instead of scholars. Yeah, we have to listen scholars, but their speeches may be changed or not, we can not be sure of this. So that we have to referre only quran in open forums. While I would have to check with the original text and double check the translations, the way those are worded do not indicate a flat Earth (nor do they contradict it). However they do point to a geocentric model with massive differences to what we know of reality today. Great, one made up system is supporting another made up system. I won't attempt to judge but what the early Muslims wrote is a good guide to how they interpreted the Quran. The early Muslims duplicated the technique of Eratosthenes, to measure the circumference of the earth, 200 years before Al Biruni. But, that technique had a basic flaw. Al Biruni came up with a better idea, to measure the circumference of the earth, based on trigonometry. An illustration from Biruni’s Persian book. It shows different phases of the moon. Then some modern Islamic writers ridicule Western science and astronomy in the "Dark Ages". They claim, probably rightly, that Muslim astronomers developed the heliocentric Solar System hundreds of years before Copernicus. As regards the movements of the earth, the position was somewhat different. The question whether the earth was at rest or not, was not discussed in Europe either in the early or later Middle Ages. Generally, the earth was assumed to be at rest in the center of space. Al-Biruni, assuming the vague Babylonian and Indian conceptions, believed in the turning of the earth on its own axis. He also believed in the movement of the sun round the earth, though he did not reject the suggestion of abu Said Sinjari regarding the possible movement of the earth round the sun. 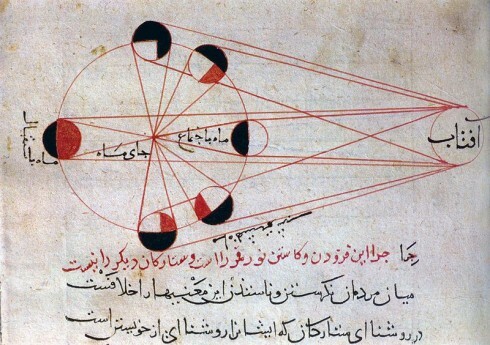 In the second half of the seventh/thirteenth century the question of rotation was taken up by 'Umar al-Katibi al-Qazwini (d. 676/1277), who was connected with the Maraghah observatory and prepared an edition of the Almagest. His work Hikmat al-'Ain contains argument for the heliocentric theory. Un­fortunately, he finally rejected the idea of the circular motion of the earth and, therefore, failed to anticipate Kepler and Galileo. Among others, who took up this question, was Qutb al-Din, a pupil of Nasir al-Din Tusi. His semi-­geographical work, Nihayet al-Idrak, contains a discussion of these questions. Thus, Muslim mathematical geographers often expressed doubts on Greek and Ptolemaic concepts about the earth. Sarton rightly emphasizes that the doubts expressed in Arabic writings were not sterile as they eventually paved the way for the Copernican reform in 950/1543. Dates in that document are expressed as "Islamic Year"/"Gregorian Year", where the "Islamic year" starts from the Islamic New Year of AD 622. Biruni's illustrations are not about the heaven's being space. Everybody mention how biruni says the earth being round. But nobody mention he said "when I was said its being round, I have aimed its being round like a circle, not aimed like a rock". 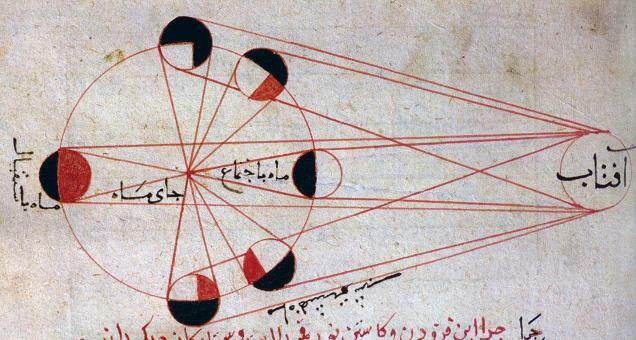 The only illustration of Al Biruni that was shown was his diagram illustrating the phases of the moon and that can only apply to the Globe earth and the sun and moon far away. No, Everybody mentions how Al Biruni says the earth is a Globe and most people in that region knew that the earth was a Globe! Around 830, Caliph al-Ma'mun commissioned a group of astronomers to measure the distance from Tadmur (Palmyra) to al-Raqqah, in modern Syria. They found the cities to be separated by one degree of latitude and the distance between them to be 66 2/3 miles and thus calculated the Earth's circumference to be 24,000 miles (39,000 km). Another estimate given was 56 2/3 Arabic miles per degree, which corresponds to 111.8 km per degree and a circumference of 40,248 km, very close to the currently modern values of 111.3 km per degree and 40,068 km circumference, respectively. That would have been meaningless if the earth were not a Globe. Why would he? I can't even work out what you mean! Thanks for split my post. It gives me right to split it more. You have to reply all the statements. You sure? Where is biruni's book? Where is his signature? And where is verification of his signature? And who did verify his signature? We don't know what biruni says, nobody heard him. The only text I see about him was saying the earth's being flat. I did not live before 200 years of Biruni. I think you lived it since you've mentioned it with an aplomb like an aubergine. That means something if a glober claimed him written by Biruni. You say, "The only text I see about him was saying the earth's being flat". Please show where Al Biruni "was saying the earth's being flat". Just your own words mean nothing. The rest of my quotes were from Muslim sources and they were probably "globers" too because they know the true shape of the earth, just as Caliph al-Ma'mun, Al Biruni and Umar al-Katibi al-Qazwini did about 1000 years earlier. Not only that but Umar al-Katibi al-Qazwini but also "was connected with the Maraghah observatory and prepared an edition of the Almagest". The Almagest was astronomer Ptolemy's work on the cosmology of the time which had a stationary Globe with far distant sun, moon, planets and stars - though not as far distant as we now know. So it is enough a Persian writing to prove him saying the earth's being flat, like how you did it. This is biruni's writings, not mine. I've not created a web site in the name of wiki islam. If you love it so marry with its owners. And you might also claim that the Muslim Times is written by "globers". Lie! Show me when I told "Muslim times" written by globers. Do not change my words by using your comment. That I say what I say. They may be manipulated or deceived by somebody else. I don't know them, I don't know who you are too. They do not know the trus shape of the earth because they do not get the science. They are scholars, they are works on religional texts, not scientific documents. And even so many of them says earth's being flat. Names can not strenghten your theories. If you are going to try and photoshop it to pretend, at least try doing a decent job. Why not just take the more "rational" route of claiming Biruni was a heretic that was going against Islam and that Islam itself (i.e. the Koran) teaches Earth is flat? That's funny! Your diagram seems to have some very black Persian text, ("جهان مسطح است") that I can find on none of the other of the numerous versions of Al Biruni's diagram. Just do a Google Image search on your diagram and the only copy seems to be yours! I wonder how that came about? So, Mr Wise, whst i am claiming is that "جهان مسطح است" is your writings not Al Biruni's. By the way your quality of "Photoshopping" is appalling. Prove its not belonged to Biruni. Which institute has the authority to decide something being whether belonged Biruni or not. And who has verified who is Biruni. I showed it and say it belongs to Biruni. You deny me. I deny your source too. What's next? OK, I can give you very solid evidence that someone, probably you, made additions to the original diagram. But my diagram, "An illustration from Biruni’s Persian book" from Al Biruni: One of the Greatest Pioneers of Science, shows no such modified areas! That looks highly suspicious to me! I can not see the diagrams because your patrons have forbid us to see them. Use the website in my signature then I can say something. Otherwise I can not say anything that I can not see. PS I haven't registered on https://resimyukle.xyz so those might disappear.